John W. Hall. 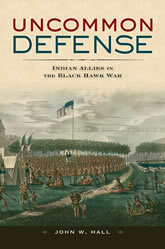 Uncommon Defense: Indian Allies in the Black Hawk War. Harvard University Press, 2009. In the spring of 1832, when the Indian warrior Black Hawk and a thousand followers marched into Illinois to reoccupy lands earlier ceded to American settlers, the U.S. Army turned to rival tribes for military support. Elements of the Menominee, Dakota, Potawatomi, and Ho Chunk tribes willingly allied themselves with the United States government against their fellow Native Americans in an uncommon defense of their diverse interests. As the Black Hawk War came only two years after the passage of the Indian Removal Act and is widely viewed as a land grab by ravenous settlers, the military participation of these tribes seems bizarre. What explains this alliance? In order to grasp Indian motives, John Hall explores their alliances in earlier wars with colonial powers as well as in intertribal antagonisms and conflicts. In the crisis of 1832, Indians acted as they had traditionally, leveraging their relationship with a powerful ally to strike tribal enemies, fulfill important male warrior expectations, and pursue political advantage and material gain. However, times had changed and, although the Indians achieved short-term objectives, they helped create conditions that permanently changed their world. Providing a rare view of Indian attitudes and strategies in war and peace, Hall deepens our understanding of Native Americans and the complex roles they played in the nation’s history. More broadly, he demonstrates the risks and lessons of small wars that entail an “uncommon defense” by unlikely allies in pursuit of diverse, even conflicting, goals.